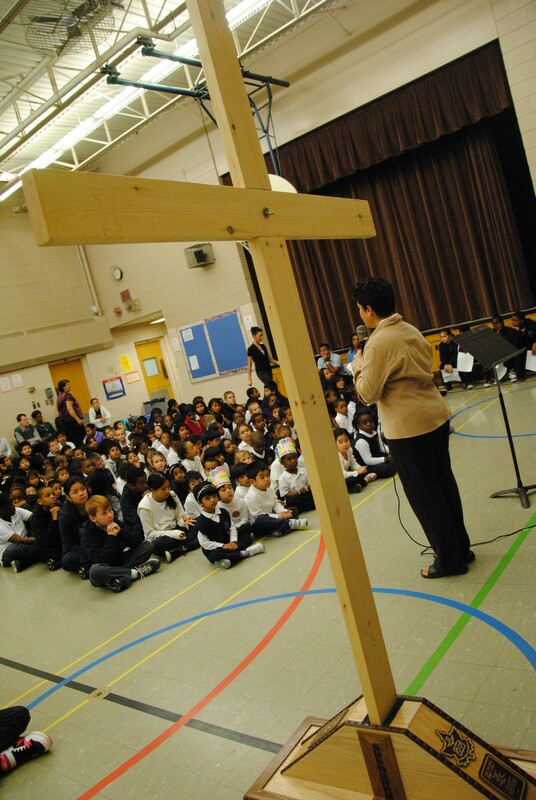 St. Boniface Catholic School in Toronto. The question of funding for Catholic education in Ontario is similar to the question of reforming the first-past-the-post system we employ for electing members of parliament – any rudimentary thinking on the issue would show it to be egregiously undemocratic and discriminatory, yet politicians are consistently able to hide behind a perceived public distaste for altering the status quo. Which may have been the case for much of the past century and a half that separate schools have existed in this province. But as Ontario’s deficit tops $16B, difficult choices will be made across the board to find ways to curb spending. And spending on two parallel system across the province when one would suffice in a majority of jurisdictions seems a simple enough example of eliminating an easily-defined redundancy. For those of you who need a brush-up on the history of Catholic funding in Ontario, in September, Torontoist assembled a useful history of Catholic school funding in the province to bring people up to speed. It was in response to a decision from Catholic school boards to disallow Gay-Straight Alliances in their schools, and the ensuing protest at Queen’s Park. These and other social issues – debating the continued use of kilts, which many school boards feel have become hyper-sexualized – have made headlines recently. It goes without saying that the policy of funding Catholic schools is discriminatory. In fact, the very notion of ‘separate-schools’ is anathema to the inclusive multicultural society Canada strives so hard to fabricate. And the issue here is not with religion per se, or any specific denomination: the systemic funding of any one religious denomination over another is textbook discrimination, and it would be no different if the catalyst for funding separate schools was for kids with blue eyes, or students who like soccer. So simple and straightforward discrimination this is that one wonders why some provinces continue this historical error. And the trend in funding separate schools is on the decline in Canada. Only Alberta, Newfoundland, Ontario, Quebec, Saskatchewan, Northwest Territories, and Yukon continue to fund Catholic schools with taxpayer money, while the rest have moved away from separate funding. Canada has also been found in violation of article 26 of the International Covenant on Civil and Political Rights in 1999 by the United Nations Human Rights Committee for its decision to continue funding Catholic schools to the exclusion of other religious denominations. In the 2007 Ontario election campaign, then-Progressive Conservative leader John Tory found out just how unpopular the measure of separate school funding was when he made expanding the level of separate school funding a focal point of his campaign. Tory saw the injustice of Catholic funding for what it was, but opted to extend the discrimination by offering taxpayer money to other religious denominations for their schools, rather than curtail separate funding altogether. Needless to say, Mr. Tory lost the election, largely on that one issue. And McGuinty, the ‘Education Premier,’ coasted to victory opposing it. The flip-side to this, as Radwanski points out, is that is opposing Tory’s plan to expand the separate funding, McGuinty sided himself not with reform, but with the status quo. But as an Irish-Catholic himself, and one who is married to a separate-school teacher, McGuinty is in a unique position to tackle to problem. “Nobody will have more capital to address this particular issue,” writes Radwanski. And McGuinty can spearhead these critical changes to the education system with the veil of economic reform and deficit-reduction as his shield. Finance Minister Dwight Duncan has signaled that only Health Care and Education are ‘key’ ministries that will not see significant reductions in programs and operating budgets, but with the scope of the deficit increasing, expect Duncan to have an eye towards finding any and all redundancies and dismantling them as quickly as possible. PC leader Tim Hudak, who many suspect will be itching for a fight when the Spring session starts, would love an opportunity to label McGuinty as a promise-breaker who cannot be trusted to preserve the historical tradition of protecting religious freedoms. You seem to be forgetting that “de-funding” Catholic or “separate school” boards requires a Constitutional amendment. You think that’s going to occur? I certainly don’t. Fair enough, but how have other provinces gone about this? Only seven provinces and territories currently provide that type of funding. And with education falling under provincial jurisdiction, is this not something that provinces have the authority to act on? Newfoundland did it with the simple stroke of an executive pen.